Three intergalactic adventures from the archives of the Children’s Film Foundation land on DVD for the very first time. 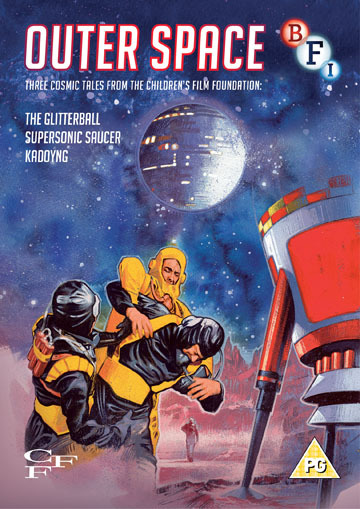 In the award-winning The Glitterball (Harley Cokliss, 1977, 56 mins) two teenage boys try to help a tiny spherical alien get back to its mothership, while the army and a devious petty crook pursue the creature for its wonderful powers. With Ben Buckton, Keith Jayne, Ron Pember and Marjorie Yates. In Kadoyng (Ian Shand, 1972, 60 mins) it looks as if nothing can stop the village of Byway being demolished to make way for the new motorway – until a mysterious visitor accidentally arrives from Outer Space. With Leo Maguire, Adrian Hall, Teresa Codling and Bill Owen.